Yesterday was Memorial Day in the United States, a federal (national) holiday to remember those soldiers (members of the military) who have died in active military service (died while fighting as a soldier). During the Vietnam War (fought during the 1960s and 1970s), there were many American soldiers who became prisoners of war or POWs – those who are held by the enemy and not allowed to leave during a war. Some soldiers were missing in action or MIA – those whose whereabouts (location) was unknown. 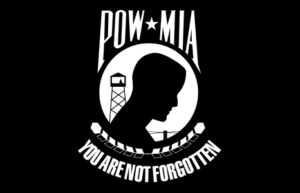 A special POW/MIA flag was created to honor and remember POWs and MIAs, and to remind Americans back home (in the United States) of the need to find out the fates (what happened to a person, or how a person died) of the men and women who serve in the military during wartime. The POW/MIA flag is black and white. It has a silhouette (an outline drawing) of a man, a watch tower (a tall structure that guards sit in to watch what happens in a prison and make sure prisoners do not escape), and barbed wire (thin lines of sharp metal used to make fences that people cannot cross). “POW MIA” is written on top, and the phrase “YOU ARE NOT FORGOTTEN” is written on the bottom. The POW/MIA flag is flown (placed on a pole for others to see) on six special days in the U.S.: Armed Forces Day, Memorial Day, Flag Day, Independence Day, Veterans Day, and National POW/MIA Recognition Day (September 15th). It is also flown at many military installations (places where members of the military work), police stations, fire stations, and similar places. In addition, military mess halls (cafeterias; large dining rooms with long tables) often leave one table and chair empty, draped (covered with a cloth) with the POW/MIA flag to serve as a reminder of the soldiers who are missing and symbolize (represent) a chair waiting for their return. * This post was adapted from the “Culture Note” from Daily English 716. To see the rest of the Learning Guide, including a Glossary, Sample Sentences, Comprehension Questions, a Complete Transcript of the entire lesson and more, become a Select English Member. There is Also a federal holiday up here , in Canada when -like Memorial Day in the U.S. – Canada honours its men and women who put their lives on line for the good of nation. Well, the day is observed in a different date -here in Canada. However ,the idea is the same -that is – paying homage to those valorous heroes and heroines who responded to the call of their country. The day up here is dubbed ” remembrance day ” though. On November 11th , we wear poppies, make silent tributes and attend commemorative ceremonies. Was it you, Peter, who once dressed up as Thorn to go to a party? I recalled that because i’ve been told that a movie about Wonderwoman has been recently released in the USA, and it is coming this summer to our theatres. I’ve already seen a promotional video. To be honest, at first sight i find the plot which develops in Europe, rather lame, although the heroine looks enough powerful. My neighbor is very excited about the première, and has invited me to go with him. I think I will go, because all in all Wonderwoman belongs to the Justice League, so I am very keen of that team. Mostly, I like Green Lantern. I know that Batman and Superman are much more popular. Nevertheless, the color green has always been my favourite. I also enjoy Flash Gordon, for the Queen.